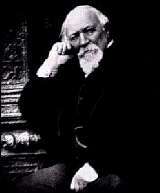 Robert Browning is regarded as an influential English poet and playwright of the Victorian era. However, complex syntax and arguments make some of his work difficult to read. Browning wrote primarily dramatic works for the stage. Browning's father was a clerk with the Bank of England who had a substantial library that included philosophy, history, and biography. His mother gave her son an appreciation of music. Browning lived with his parents until 1844. Browning had minimal formal schooling, mostly from his father. At home, he learned Greek and Latin. In 1828, he attended classes at London University for one term. In 1833, he wrote his first work, Pauline: A Fragment of a Confession. This dramatic monologue dealt with feelings of adolescent anxiety. It was attacked by the great writer and philosopher John Stuart Mill for Browning's open display of his emotions. Browning's future writings were pointedly missing this content. Browning briefly traveled to Russia in 1834 with Russian consul George de Benkhousen and to Italy in 1838 and in 1844. During the time from 1832 to 1846, he wrote and published seven long plays and many dramatic poems. The poems My Last Duchess, Porphyria's Lover, and Song (From Pippa Passes) were part of a series, entitled Bells and Pomegranates, which demonstrates his skill in dramatic monologue and lyric. Browning's creative output slowed and changed after his marriage to Elizabeth Barrett in September 1846. The couple traveled to Italy, hoping that the change of location would help improve Elizabeth's health. The pieces that Browning wrote in this period were ill-received and he took to molding clay sculpture during the day and socializing at night. After Elizabeth's death in 1861, Browning returned to England with his young son, Robert, and started writing again. Many of the works written between 1863 and 1887 were long dramatic poems, often dealing with contemporary themes. From 1868 to 1869 he published his greatest work, The Ring and the Book, a twelve volume epic about a murder trial in Rome in 1698. It was enthusiastically received and placed Browning on the stage of public popularity. At the age of seventy-seven, he returned to Venice for vacation. Here, Browning caught cold and died on December 12. His body was returned to England and buried at Westminster Abby.